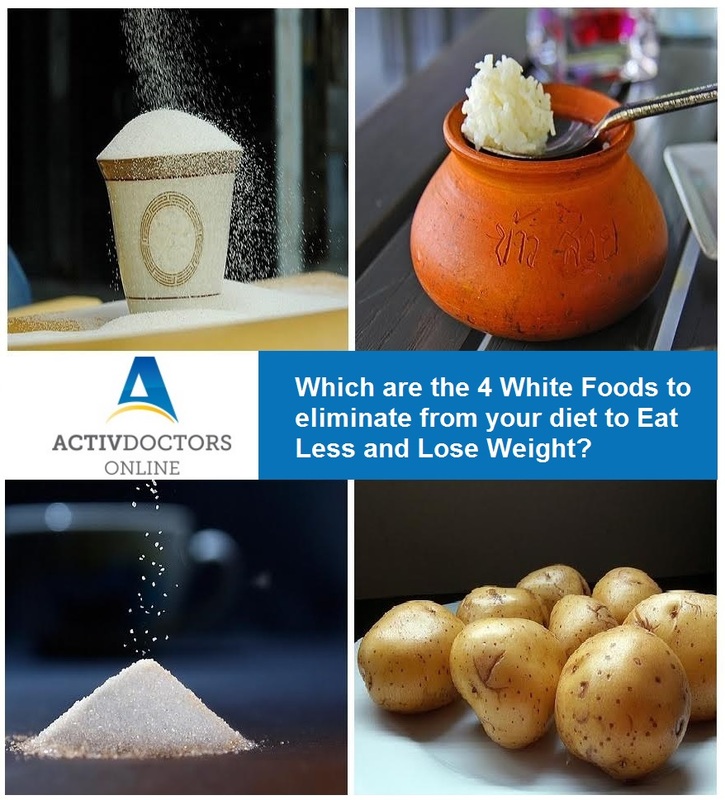 Which four WHITE foods should you eliminate from your diet to eat less and lose weight? Rice, Potatoes, white bread /maida and Sugar! Wow. yummy foods. But fact is that, all this sweet, tempting mouth savoring food can be a cause for long term chronic illness. Very commonly used white foods, especially white rice, potatoes, white bread/maida and sugar are those four foods that lead to instant cravings for carbohydrates. Eliminating or reducing the quantity of these foods makes it easier to eat less and lose weight. HOW DOES THE CONSUMPTION OF WHITE FOODS CAUSE TO EAT MORE? Eating white foods cause sudden spike of blood glucose in our body. As a result our body releases extra insulin in order to balance the blood sugar/glucose levels. This abrupt drop in blood glucose, forces your body to crave for more food and carbohydrates. This excess carbohydrate that your body thus receives, stores as fat, leading to weight gain. Avoiding white bread/maida, rice, potatoes and sugar can be useful in weight loss, but it is recommended to reduce intake gradually while ensuring a healthy balanced diet along with regular exercise.